Is it possible multiple tessel board crosstalk? Hello, I just wonder if it is possible to communicate with two or more tessel boards? I saw the document show tessel can use I2C to connect another modules. In our project, we need tons of pins, so we try to enrich our pins by combining two or more tessel board. Thanks for posting your question here. 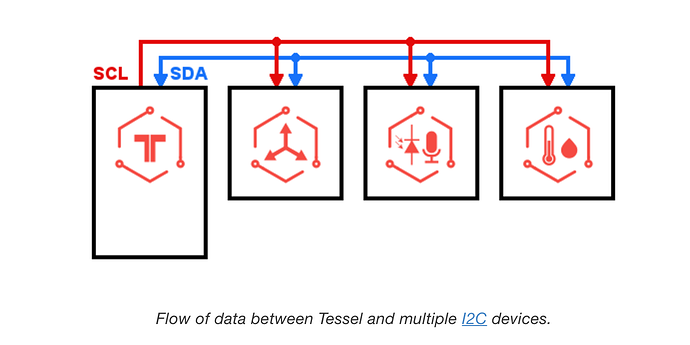 To clarify, you want a module to talk multiple Tessel boards? Or are you asking if one Tessel can communicate with other Tessel boards over I2C? My Question is "one Tessel can communicate with other Tessel boards over I2C". Due to we plan to use about 3~5 servo/pwm Modules and two relay modules, but it seems one Tessel 2 board only has two ports. Below few solutions, I still consider which are more workable & efficiency. Actually, I still prefer to use single Tessel 2 board. 1.For Tessel 2 (port A and port B), is it possible to use breakout method to parallel connect with multiple modules (ex: 3~5 servo/pwm modules) in single port? Is it like a multiple Tapping socket? If it is workable, how should I defined and control those modules? To use I2C or SSH connect the multiple Tessel boards. Use Mongodb or Firebase to fetch and communicate between multiple Tessel boards. Due to the instantaneity reason, I think it is better to use internal network and ethernet LAN.